← Has Thor Struck Hammer Blow In Superhero Wars? This week, the first teaser trailer for The Muppets was released, under the fake name Green With Envy. The trailer starts off as a generic romantic comedy, with a ‘big reveal’ towards the end that it is, in fact, a Muppet movie. The trailer doesn’t really give away much of the plot of the film, and the fact that Amy Adams and Jason Segel are in it make it pretty obvious, to be honest, that it is the Muppet trailer before the first hint of green hits the screen. You can see the trailer here at www.heyuguys.co.uk. As I said, you can’t really tell much from the trailer, as the majority of it is ‘fake’, but what little we can glean from it does trouble me a little. 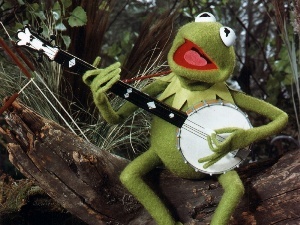 If you read my Kermit the Frog birthday post last week, you know I am a big Muppet fan, so I am hoping for great things. My concern, based on what little we know, is that this is not what we are going to get. The marketing team behind the film obviously felt the misleading tease would provoke a big reaction when Kermit appeared on-screen, but it is a cheap trick. This kind of gimmicky marketing suggests to me that there is not enough confidence in the film. OK, it is just a teaser, and the full trailers will undoubtedly be more confidential. But if I remind you that the first Scooby Doo trailer featured a similar kind of bait and switch, you might start to understand why I’m worried. If you have full confidence in your product, you don’t rely on trickery, you are proud of what you have and put more care into its introduction. Remember, this is the first we’ve seen of the movie. Except a couple of posters, of course, which again are a bit underwhelming. A genuinely odd teaser poster, rendered redundant by the fact the synopsis has been available online for months, and another blandly generic poster that gives you nothing. Everything I’ve seen so far suggest the studio aren’t sure quite what to do with The Muppets. It is going to be a real challenge to make them relevant to a new generation, and turning the movie into an extended sitcom episode of the tone of How I Met Your Mother is a very lazy attempt at this. It is obvious that Segel is going to play a big part in the new movie, and again, this shows a lack of faith in the Muppets ability to carry an audience, and the film. This may well be a correct assumption, but if you are going to give the Muppets one last opportunity to drag themselves into the movie scene, you have to go full-bore. A successful, Segel lead Muppet movie is only going to benefit Segel in the end, and leave The Muppets with a gap requiring of another human crutch for the next film. Muppets From Space was entertaining enough, but really wasn’t good enough to create a new audience for Jim Henson’s creations. The sad truth is that they may just have had their time, and belong as a gimmick for adverts and the like rather than feature films. A re-invention may be in order, but based on the synopsis for the latest movie, it is more of a retread of familiar ground. I’m still looking forward to The Muppets, just not as much as I was. I’m not convinced they are in the best hands, and my concern that they do not have a place in today’s culture has not been allayed. I’m hoping I am wrong, and that this teaser trailer is meant to throw us completely off the scent of what is really in store. If this latest attempt at a revival does not work, it may well be the end of the road for the fuzzy puppets. If it is, another small part of my childhood will be gone. This entry was posted in Articles, News and tagged amy adams, kermit the frog, marketing, muppet movie, news, the muppets, trailer. Bookmark the permalink.